Over 70 million Ethiopians consume a crepe-like sourdough flatbread called injera as their staple food. 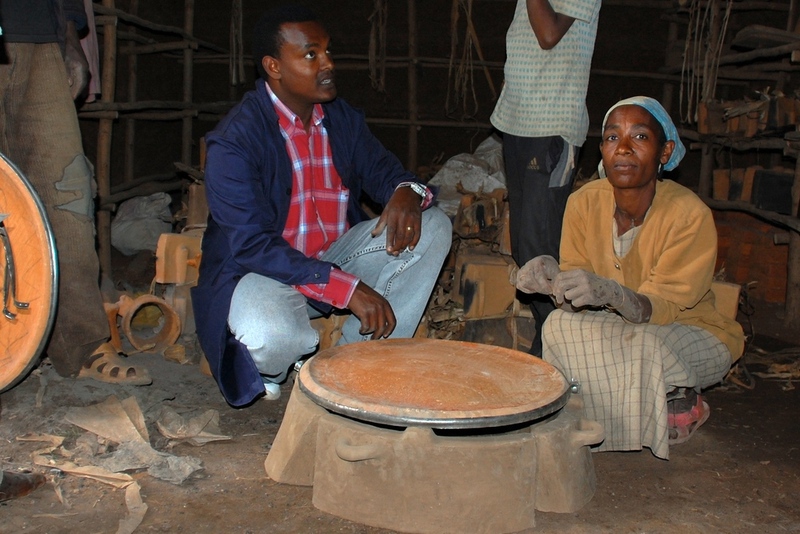 Injera is cooked on large clay discs called mitads, heated over open fires. Yet mitads are extremely fragile: large, made from poor clay, and fired with pre-industrialized processes, they are quite prone to breaking. Bumps from children or animals, even thermal stress for normal firing and cooking can shatter a mitad. Most families replace their mitads 4-7 times per year, at a cost of $5 each. 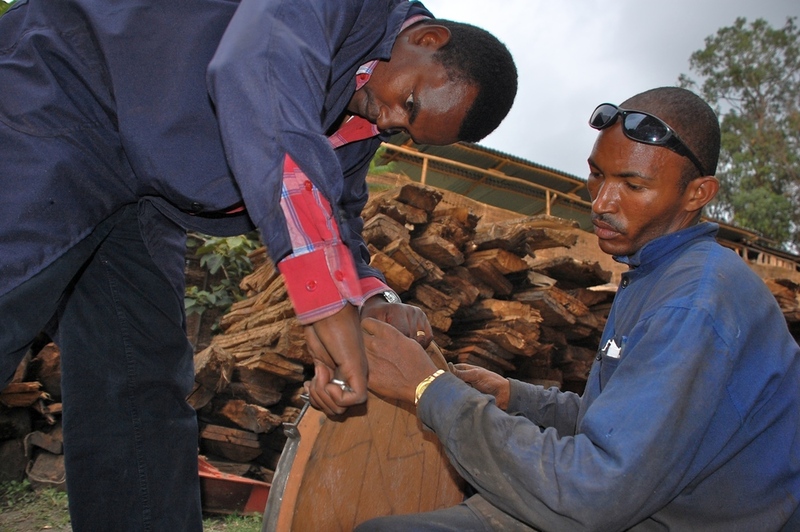 Since the median Ethiopian family earns only $180 a year this is an onerous cost. Spending $30 on cooking discs often means there is not enough money to send children to school or buy other basic staples. Surrounding a traditional clay mitad with a compressive band of steel pre-stresses the clay, just as rebar reinforces concrete bridges. By placing the ceramic earthenware in compression the disc is able to withstand day-to-day abuses. The surrounding band also allows for cracked mitads to be held together in a working condition for months, further reducing the impacts of breakage. The Mighty Mitad is a pair of C-shaped metal bands with tabs at the ends for bolting the two halves of the circle around typically sized discs. By tightening the two C-shaped halves around the circumference of the mitad, the clay is radically strengthened. The COGS is under $1, allowing manufacturers to make a profit at a retail price of $2 – increasing the cost of a replacement mitad only 30%. The modest cost increase is well within the spending capabilities of most first-time buyers, so explicitly saving for the device is unnecessary. After demonstration of the benefits adoption has been rapid and the response overwhelmingly positive: over ten thousand units were sold in the first 6 months of production. After using the Mighty Mitad for several weeks the reviews were universally glowing, with families sending children to school with savings, buying new clothes, more nutritious food, and allowing them to save modest sums. I worked with local entrepreneurs to setup production, distribution, and sales of the Mighty Mitad. By designing simple production tooling overall capital expenditures were kept under $300. Manufacturing is localized and relies on unskilled labor and readily available materials of low-carbon sheet steel and lag bolts. Keeping costs low enabled the business to be profitable in under 2 months of part-time operation. Installation, distribution, and sale of the Mighty Mitad bands is then done by local clay-making villages. Relying on sales by claymakers ensures wide distribution of wares by established vendors, while reducing impacts on earthenware economies. While total sales volumes for clay vendors will certainly be reduced as replacements become unnecessary, we have found most clay making villages were are readily willing to participate in the Mighty Mitad project. This is driven largely by the cultural impacts of mitad fragility. The social stigma of having traditionally sold clay products that so negatively impact people's livelihoods is enormous: claymakers are widely despised and mistrusted. (Consider: if you sold a device every single person used daily, yet that broke every 10 weeks and cost so much to replace that many families could not afford to send their kids to school you also would be a hated pariah.) Thus we found most mitad makers / vendors were ready to embrace an opportunity to win back the trust of the wider community with a genuinely effective and improved product.